Overclockers UK has eluded to a not-too-distant launch of Corsair's new micro-ATX cube case, the Carbide Air 240 as it goes up for pre order. The Carbide Air 240 also retails for a fair chunk less than Corsair's other micro-ATX case, the Obsidian 350D, which currently retails for around £80. The case is considerably smaller than the Carbide Air 540 and also 8cm shorter than the Prodigy while being just 1cm wider and 4cm deeper. 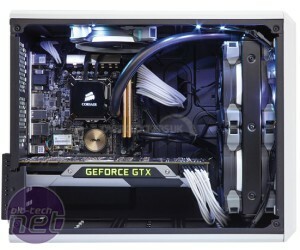 It still manages to pack in the dual compartment feature of its larger sibling, with the PSU and drive mounts in one side out of the way, and the core hardware in the other. The case can stand upright or on its side with the large side window facing upwards. It also sports two 120mm front and roof fan mounts (four in total) plus a further set of two 120mm fan mounts in the base, a side 120mm fan mount and two rear 80mm mounts. We've also seen plenty of images of double 120mm-fan radiators in the front so like the Prodigy, the Carbide Air 240 looks set to be water-cooling friendly too. 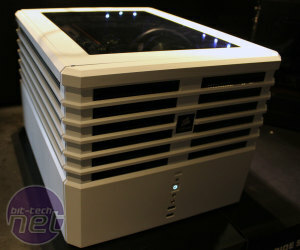 Are you in the market for a micro-ATX or have your eye on the Carbide Air 240 already? Let us know in the comments.